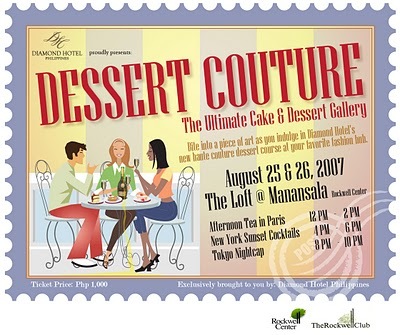 From August 25 to 26, 2007, Diamond Hotel and The Rockwell Club will be hosting an event called Dessert Couture. Indulge in Diamond Hotel’s new line of desserts designed by the celebrated pastry chef, Mr. Pang Kok Keong of Singapore, who was crowned Cacao Barry Pastry Chef of the Year 2007 at the World Gourmet Summit in Singapore. Enjoy overflowing champagne while relaxing to live entertainment. Witness The Loft at Manansala transform into Paris, New York and Tokyo! Also, get an exclusive preview of Diamond Hotel’s upcoming dessert delivery and catering service. Exciting giveaways also await lucky gourmands! This two day, dessert banquet will put you back by Php1000. If you are lucky enough to be a Rockwell Club member (or know someone who is), you can avail of a 20% discount on the ticket price. You can get your tickets at the Diamond Hotel or The Rockwell Club. Event proceeds will go to Pathways for Higher Education. Admittedly, I’m not much of a dessert person but even I’m having a hard time passing on this. Many thanks to Irma for sharing the information. Haha, before I even read your phrase "frou frou fashionista" those were the exact words running through my head when I read "Rockwell" and saw the invite. It would be nice to throw a dessert party ... have everyone donate their favorite cake (but plan ahead so no duplicates) and in one room you could have a Vargas Butter Cake, Cuerva Mango Torte, Yulo Strawberry Shortcake, etc. You end up spending around P1000 per person (depending on what you bring), but you'll be in the company of friends in the privacy of your own home (no frou frou fashionistas around). My love for dessert is well-documented but for some reason, this event isn't making me want to run out and buy a ticket. (And I'm not talking about the rain or the P1,000 price tag).